The 10 Best Christmas Tree Farms in Arizona! It’s beginning to look a lot like Christmas. While you may be more likely to run into palm trees and 80-degree weather in Arizona, that doesn’t mean we don’t know how to throw a wonderful traditional Christmas. Now it’s time to welcome in all the firs and spruces to really get you into the holiday spirit! Here are the 10 best Christmas tree farms in Arizona. Tim Mitchell’s has been an Arizona holiday tradition since 1950. This family owned and operated business now encompasses two lots, one in Scottsdale and one in Gilbert. Each lot includes a large selection of fir trees ranging in size from two to 30 feet. Are you planning on getting a large tree? Tim Mitchell’s offers setup and removal services for trees between 15-30 feet. They also carry wreaths, pine cone clusters, and other home decorations. Walk through a winter wonderland at Schnepf Farms. This Queen Creek farm turns into an all-out Christmas village during the month of December. You can take a visit to their Christmas tree farm, which gets fresh trees from Oregon in late November. They also have a laundry list of holiday activities, including snow sledding, bonfires, ice-skating, hayrides, and lighted train rides. Kids can even meet Santa and feed his reindeer at the annual “Breakfast with Santa” event. It’s hard to miss a Valley View Christmas Tree lot. Valley View has more than 10 locations in Arizona, spread out across the Valley and Tucson. In addition to being one of the biggest Christmas tree farms in the state, it’s also one of the oldest. They’ve been proudly serving Arizona since 1980. Valley View has a huge selection noble, grand fir, and Douglas trees of up to 15 feet. They offer free delivery and even have a firework tent that opens on Christmas Eve. Vertuccio Farms is all about the holidays. This family-run farm is known for hosting their annual fall festival event. Starting in late November, however, Vertuccio Farms is all about Christmas trees. The farm is home to a large inventory of fresh-cut trees from Oregon. The best part? You can walk around and enjoy free cookies and hot cocoa while you browse. You don’t have to go to the mall to meet Santa. Take a trip to Tolmachoff Farms in Glendale instead. This fourth-generation farm has come along way since being a roadside stand in the 1970s. Their Christmas tree lot is open all of December until through Christmas Eve and includes Douglas, noble and grand fir trees. Customers can also enjoy hot chocolate, apple cider, kettle corn, and s’mores near the bonfire. Looking to escape the heat? Make a trip to Mortimer Farms in Dewey. This locally run farm is located a little over an hour north of Phoenix. You can enjoy cool weather and holiday cheer at their annual Christmas Village. 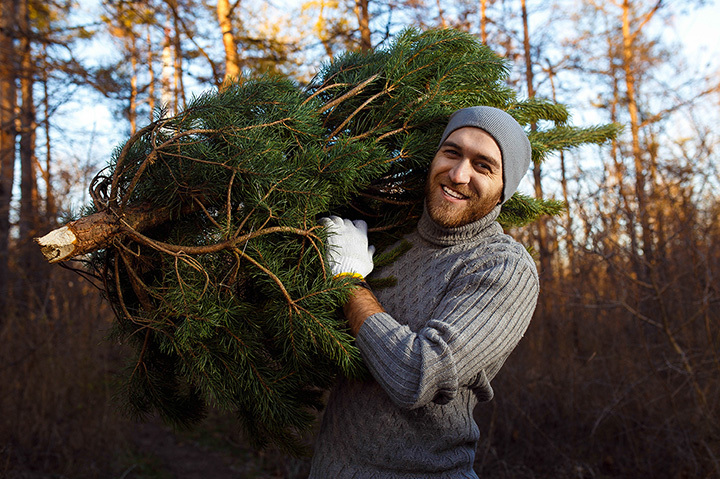 It’s home to freshly-cut Nordmann and noble fir. You can also head to the Farm Park to see farm animals, buy holiday treats, and gather around the campfire. The more the merrier at Mortimer. You don’t have to travel to enjoy the snow. Mother Nature’s Farm has you covered. Mother Nature’s Farm hosts an annual snow day where the whole family can enjoy a White Christmas. The event includes a snow hill, hayride, maze, air bounce, and food and drinks. They also sell Douglas firs and noble firs throughout December. Tucson residents can get in on the holiday fun by visiting Buckelew Farm. They sell Douglas fir, noble fir, grand fir, and Nordmann fir at all of their thirteen Tucson lots. Their trees arrive fresh from Oregon every week and range in size from two feet to 14 feet. In addition to trees, Buckelew Farm sells holiday favorites like wreaths, firewood, and southwestern chili strings. Mast-Roth has been providing local families with Christmas trees for nearly 40 years. They carry five types of trees up to 14 feet-tall at all of their five valley locations. Mast-Roth also carries a large selection of wreaths and fireworks to help get you in the holiday spirit. Worried about your tree dying? Don’t sweat it. Mast-Roth created the “Saint Nick Watering System” that helps you water your tree and extend its life. Come get a snow-covered tree at Viola’s Flower Garden. Viola’s is a Flagstaff nursery that transforms into a Christmas tree lot in December. The nursery is decked out in holiday décor and lights. All of their trees come from the northwest and are between three to 12 feet. Viola’s also sells holiday wreaths for an extra touch of Christmas cheer.